After the incident last year when two University of Pretoria students wore blackface to a party, one could assume we would all be clear on the fact that blackface is racistÂ and shouldn’t be worn. Sadly, oneÂ Wits medical student still hadn’t gotten the memo. PONTSHO PILANE explains. 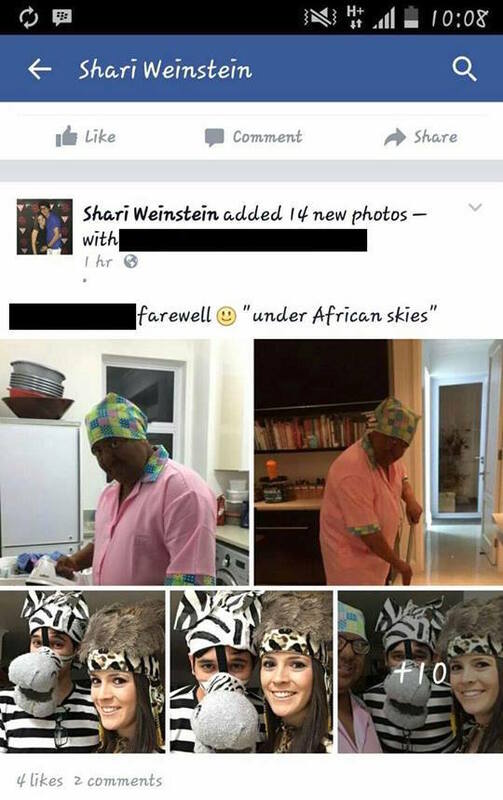 It seems to be the same script everyÂ timeÂ -Â a group of students decided to throw a party (this time it was themed Under the African Sky) and one of them thought dressing like a domestic worker while wearing blackface would be a good idea. 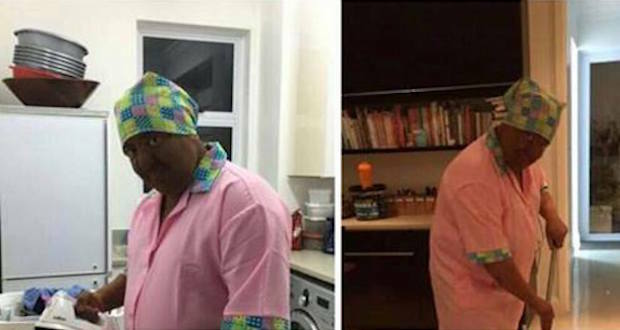 A 4th or 5th Wits Med Student not knowing that #BlackFace and making mockery of domestic workers are offensive? WTF is that? 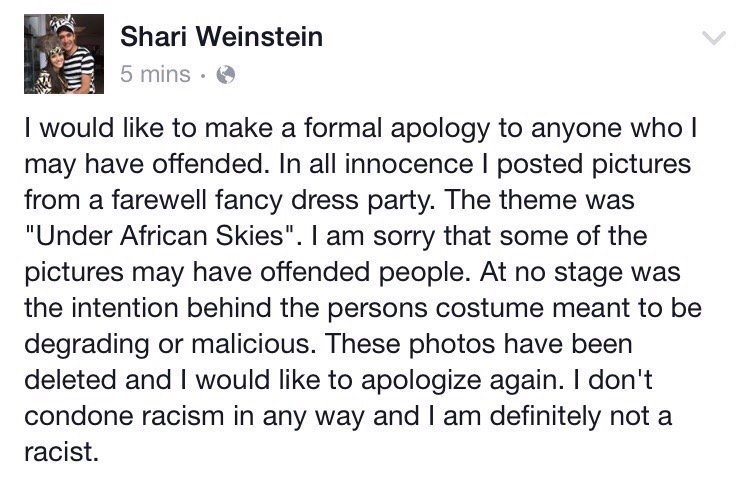 Winstein offered an apology saying that she had posted the pictures “in all innocence” and that â€œsome of the pictures may have offended peopleâ€. Melissa Steyn, professor of the Wits Centre for Diversity Studies, describes blackface as â€œa visual equivalent of a racist jokeâ€. Blackface, started in American minstrels shows in whichÂ white people would perform in blackface, portrayingÂ black people as lazy and playing up perceptions of black people as sub-human for the sake of laughs. Blackface is based on the notion of making black people look inferior. It is a performanceÂ that often exaggerates certainÂ features of black people, as whenÂ the UP students stuffed pillows into their pants. ItÂ seems the go-to representation of black people by the students involved is always that of a domestic worker. (In the 2014 incident at UP, the students also dressed as domestic workers.) These university-going young adults are surely exposed to a variety of black people every day, including classmates and lecturers,Â yet they choose to impersonate domestic workers for laughs. It is clear that these students do not see black people beyond those inÂ subservient roles. In short, blackface is and will always be wrong. Do. Not. Do. It. And while you’re at it, don’t post pictures of other people doing it among theÂ happy snaps from your party. In fact if someone turns up at your party wearing blackface, tell them to get some perspective and go wash their face. * A previous version of this story implied that more than one Wits med student was involved in the incident. This has been corrected. Is black face always wrong? I agree that in this case it could be considered racist/wrong at the very least distasteful. I’m white and one of my hero’s is Neil Degrasse Tyson, who is black, so if I go to a fancy dress party dressed up as Neil, including black face, would you consider that wrong or racist? Yes, that would be both racist and lazy. If you’ve put enough effort into it, a moustache and suit together with your demeanor should do the job. People of colour don’t go around painting themselves shades lighter when they go to costume parties dressed as white characters or people. No, the constant fixation on race is what is racist and wrong. We talk about inclusion, and diversity, but when it’s practiced it’s ‘racism’ and ‘cultural appropriation’. It’s part of the white guilt Kafka-trap the Sociology and gender study departments have laid out to perpetuate a system where only straight white men can be sexist or racist by the definition which they teach, and who it’s impossible to be racist or sexist toward. The claim is always ‘white supremacist patriarchy’ and yet anything which offend a ‘minority’ leads to mass castigation and often legal punishment, firing or expulsion. We’re at the point where women are 60% of college students, and yet are considered a disadvantaged minority. it’s ludicrous, and so is this hyper-vigilance of race issues. Not wrong. If painting blackface is wrong them being black in general is wrong. I am not responsible for the history of people before me. Also this is simply insecurities from people talking here. Just because someone paints themselfs black doesn’t mean they have an trying against black people. To determine that you need much more then their sense of humor. Also racist jokes are also not wrong, they point out the fact that racism exist and at times is very absurd. So this could very well be turned to the other side: blackface is good because the existence of it shows that people don’t get offended by what color you are before you made a joke or chose to dress as a black character.